Heat waffle iron per manufacturers instructions. Whisk together almond flour, xylitol, cinnamon, baking powder and baking soda. Add buttermilk, butter, eggs and syrup and stir until well blended (batter will be stiff). Add cold water 1 tablespoon (8 tbsp in a 1/2 cup) at a time until batter is easily spoonable and spreadable, about the consistency of a thick pancake batter. Spray waffle iron with coconut oil spray. 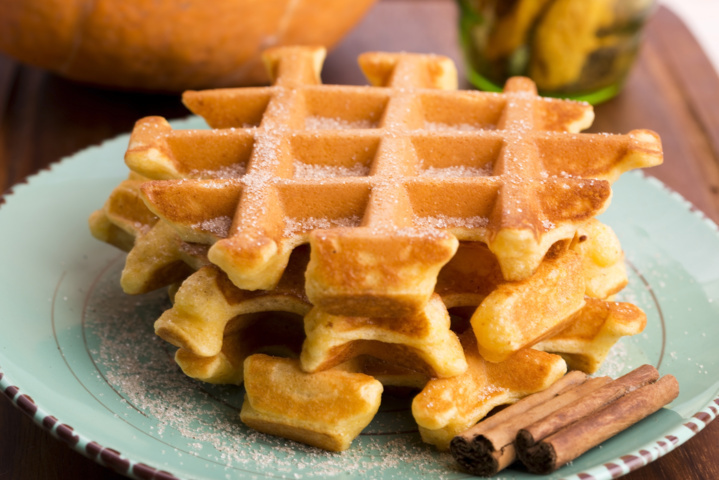 Place approximately 3 tablespoons of batter in center of a waffle iron. Cook according to manufacturer’s instructions until crisp and dark golden brown. Repeat with remaining batter. Serve warm. Enjoy! Why does this recipe contain artificial sweeteners? At SANE we advocate Progress Not Perfection. The small amount of sucralose in the sugar free french vanilla syrup is not significant enough to hinder hormonal healing. If there are any reservations about the sweetener used in this recipe, experiment with a SANE approved sweetener such as xylitol with a teaspoon of vanilla extract. To make this recipe SANEr, experiment with swapping the buttermilk for almond milk and a squeeze of lemon juice. Also, coconut oil can be used to replace some of the butter, however, the taste and texture will be slightly different. With these swaps, log the recipe as 2 x servings of whole food fats (rather than the original 1 x whole food fat and 1 x most dairy).